An Intelligent Building Market is the integration of building, technology, and energy systems. Building automation systems include building automation, life safety, telecommunications, user systems, and facility management systems. Intelligent buildings deliver actionable information about a building or space inside a building to permit the building owner or occupant to manage the building or space. 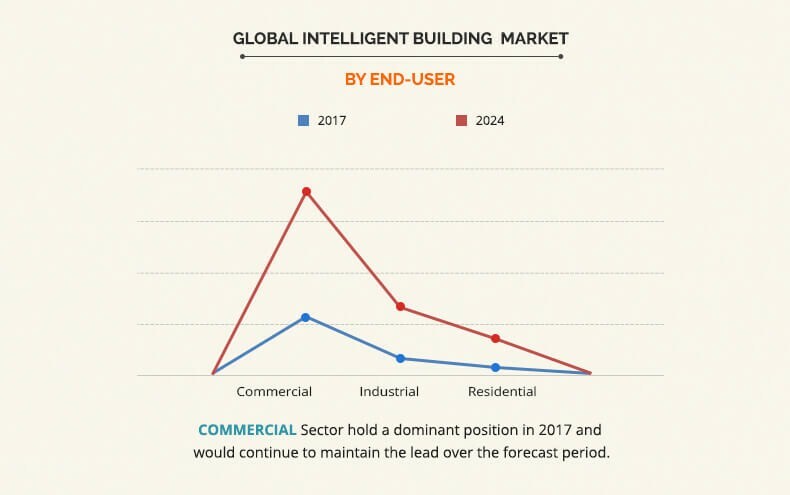 The global intelligent building market was valued at $ 12,371 million in 2017, and is projected to reach $ 42,649 million by 2024, growing at a CAGR of 19.6% from 2018 to 2024. The rise in need for the energy efficient interventions in infrastructure industry, increased market for Building automation and control system, and growth in penetration of Internet of Things (IoT) in the building management system are some of the major factors that propel the growth of the intelligent building market. In addition, rise in the development of smart city projects across the globe is expected to provide promising opportunities for intelligent building market. However, complexity of interoperability between different connected building automation systems and high investment cost required for developing an intelligent building restrain the intelligent building market growth. Building energy management system is expected to grow at a significant pace during the forecast period. The commercial segment led the market in 2017 and is expected to dominate in the near future. Furthermore, Europe is expected to dominate the overall intelligent building market during the forecast period, as it experiences the highest demand for intelligent buildings. The report focuses on the growth prospects and restraints of the market based on the analysis of regional trends. The study provides Porters Five Forces analysis of the industry to understand the impact of various factors such as bargaining power of suppliers, competitive intensity of competitors, threat of new entrants, threat of substitutes, and bargaining power of buyers on the intelligent building market growth. The global intelligent building market is segmented into component, type, end user, and region. Based on component, the market is classified into hardware, software, and service. Based on type, the market is divided into intelligent security system, building energy management system, infrastructure management system, and network management system. Based on end user, it is bifurcated into commercial, industrial, and residential. Based on region, it is analyzed across North America, Europe, Asia-Pacific, and LAMEA. The global intelligent building market is dominated by key players such as ABB, Cisco Systems, Inc., Delta Controls, Honeywell International Inc., Intel Corporation, Johnson Controls, Legrand, Schneider Electric, Siemens AG, and United Technologies Corporation. Increased need for energy efficiency, standards, and regulations of the supportive industry, and development in the market for smart cities driving the global intelligent evacuation system market share. However, high initial investment is expected to hamper the market growth during the forecast period. The demand for intelligent building is on an increase since the past few years due to constant increase in awareness about energy conservation throughout the world. Moreover, the adoption of green building and ecofriendly infrastructure has led to the construction of smart and energy efficient buildings, which regulates the energy usage and effectively manages the energy consumption in building across all the sectors. Smart technologies, such as occupancy sensors, smart thermostats, and HVAC and lighting controls help reduce energy usage in unoccupied offices, conference rooms, and other spaces. According to American Council for an Energy-Efficient Economy (AMCEE), smart technologies will save an estimated 8-18% of total energy consumption in subsectors that include Class B offices, small chain and independent retail stores, middle-tier franchise hotels, and regional hospitals. The governments across major economies are taking initiatives toward energy efficiency and sustainability in construction sector. Protocols and industry standards such as American Society of Heating, Refrigerating and Air Conditioning Engineers (ASHRAE), BACnet, network communications protocol for building automation and control systems adopted worldwide as ISO 16484-5:2003, Chartered Institution of Building Services Engineers, the ISO standard for building automation worldwide: ISO/IEC 14908-1, ISO/IEC 14908-2, ISO/IEC 14908-3, and ISO/IEC 14908-4 are expected to generate lucrative opportunities for the market growth during the forecast period. Intelligent buildings have complex operational procedures due to integration of associated additional components. This adds to the system cost as well as increases the overall cost for the smart building owing to the complexity associated with installation and requirement of experienced and skilled professionals. These systems require regular maintenance checks to ensure the functionality of the system and reliability, which results in extra maintenance cost that impedes the growth of the market. Smart cities and smart buildings improve the quality and interactivity of urban services while reducing costs and ensuring sustainability. Smart buildings support energy efficiency, reduction in greenhouse gas emission, and deployment of renewable sources of energy. The intelligent building acts as the backbone of smart city and provides great opportunities for the vendors of the smart building market. This study includes the analytical depiction of the global intelligent building market along with current trends and future estimations to determine the imminent investment pockets. The current market is quantitatively analyzed from 2017 to 2024 to highlight the financial competency of the industry. Porters Five Forces analysis illustrates the potency of buyers & suppliers in the global intelligent building industry. FIGURE 39. INTEL CORPORATION: REVENUE. Intelligent building utilizes advanced technologies and interconnected systems to support the automation of building management systems, which facilitates the efficient operation of the building and supports reconfiguration of the space in response to changing use. The intelligent building market share has increased due to the rise in demand for connectedness, increase in automation of building management, increased market for Building automation and control system, and need for energy efficient solution for saving the energy and reducing the carbon emission throughout the world. Moreover, continuous extensive growth in population especially among the developing countries creates the need for smart buildings, which offer the optimum space utilization in core comforting and sustainable manner. Due to which government of many countries are making substantial investments for smart city and intelligent building development to promote sustainable development practices to address growth in urbanization challenges. 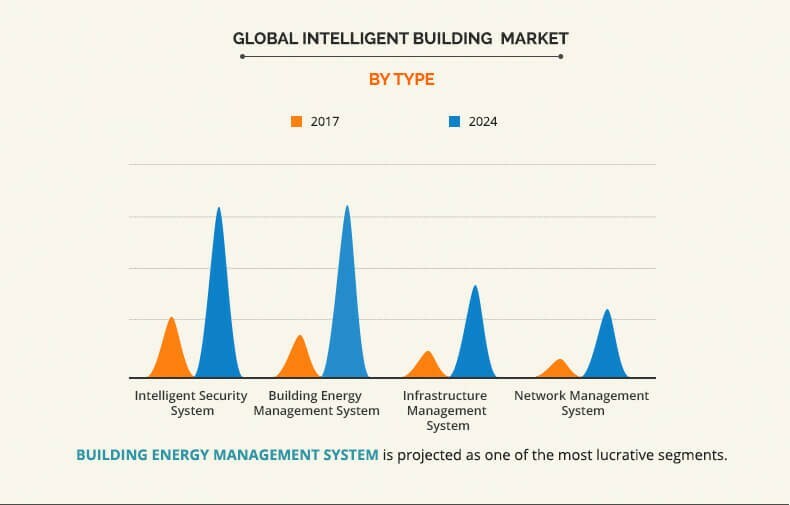 In addition, increase in need for integrated security and safety systems and decrease in operational costs due to uptake of building energy management systems (BEMS) leads to adoption or retrofitting into an intelligent building, which is expected to drive the demand for the global intelligent building market. Moreover, rise in energy efficient projects and increase in digitization across commercial and industrial buildings are expected to provide potential growth opportunities for the market. 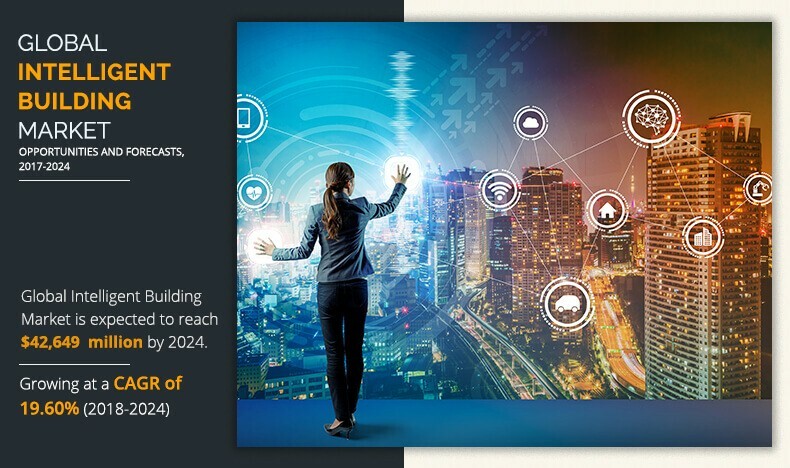 Some of the key players operating in the intelligent building market that are profiled in the report include ABB, Cisco Systems, Inc., Delta Controls, Honeywell International Inc., Intel Corporation, Johnson Controls, Legrand, Schneider Electric, Siemens AG, and United Technologies Corporation. The intelligent building market players have adopted various growth strategies to enhance their product portfolio and market penetration, as well as they launch new products to increase their customer base and to cater to the demands of the consumers.